Even if you lack the resources of Tony Stark, you can obtain a high-tech suit to enhance your natural abilities, or at least help you avoid a backache. Mechanical outfits, known as exoskeletons, are gaining a foothold in the real world. The Japanese company Panasonic announced recently that it will start selling an exoskeleton designed to help workers lift and carry objects more easily and with less risk of injury. The suit was developed in collaboration with a subsidiary company called ActiveLink. It weighs just over 13 pounds and attaches to the back, thighs, and feet, enabling the wearer to carry 33 pounds of extra load. The device has been tested by warehouse handlers in Osaka, Japan, and is currently in trials with forestry workers in the region. Panasonic’s device is among a small but growing number of exoskeletons available commercially—less fantastic and more cumbersome versions of a technology that’s been a staple of science fiction for some time. Though they have mainly been tested in medical and military settings, the technology is starting to move beyond these use niches, and it could make a difference for many manual laborers, especially as the workforce ages. Panasonic is to sell an exoskeleton designed to help with manual work. The Panasonic suit includes a lightweight carbon-fiber motor; sensors activate the motor when the wearer is lifting or carrying an object. With ActiveLink, the company is testing another, much larger suit designed to help carry loads as heavy as 220 pounds. Some other companies are showing an interest in technology that can assist workers and help prevent injury. In collaboration with ergonomics researchers at the Technical University of Munich, the German carmaker BMW has given workers a custom-made, 3-D-printed orthotic device that fits over the thumb and helps them perform repetitive tasks. Another German carmaker, Audi, is testing a wearable device from a company called Noonee, which provides back support for workers who need to perform repetitive crouching motions. Another Japanese company, Cyberdyne, already sells exoskeletons for medical and industrial use. The company’s technology, which was spun out of the University of Tsukuba, uses nerve signals to detect a wearer’s intention to move before applying assistive force. Earlier this year, Cyberdyne signed an agreement with the Japanese automation company Omron to develop assistive technology for use in factories. Exoskeletons have found commercial traction for rehabilitation and as walking aids. Earlier this week, a company called ReWalk, based in Marlborough, Massachusetts, announced the latest version of its device for people with spinal-cord injuries. The system enables people who normally require a wheelchair to walk with the aid of crutches (see “Personal Exoskeletons for Paraplegics”). 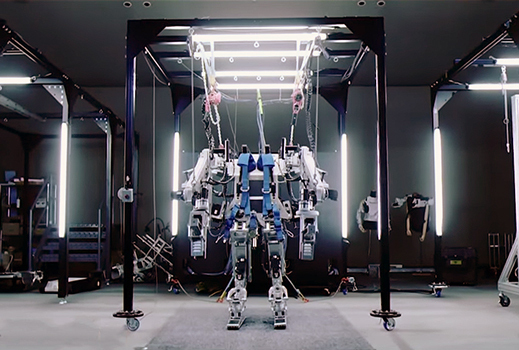 Powerful exoskeletons have also been tested by the U.S. military for some time. Progress in the underlying technology could help make exoskeletons more common. Conor Walsh and Robert Wood, two professors at Harvard University, are developing exoskeletons using novel materials and methods of assisting a wearer’s motion, making them much lighter and more comfortable (see “Motorized Pants to Help Soldiers and Stroke Victims”). If this type of technology can be commercialized, it could make exoskeletons more appealing to workers and employers.